There has recently been renewed interest in the quantification of bladder wall or detrusor wall thickness (BWT or DWT) by transvaginal and/ or translabial ultrasound. Measurements are obtained after bladder emptying and perpendicular to the mucosa, leading edge to leading edge (see Figure 1), close to the midline as identified by the urethra and bladder neck. 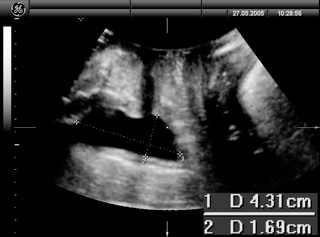 Originally, three sites were assessed by transvaginal ultrasound (TVUS): anterior wall, trigone and dome of the bladder, and the mean of all three was calculated. The author feels that the trigone (as it is of different embryological origin) is difficult to justify as a measurement location compared to the dome. In addition, there often is marked variation in trigonal thickness between the bladder neck and the interureteric ridge. 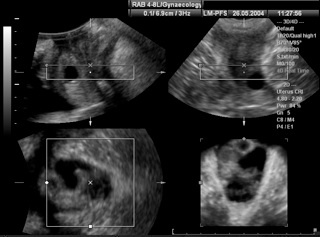 Another approach, currently used by the author, is to measure three sites on the dome, which can be performed either by translabial/ introital or by transvaginal ultrasound. Above a bladder filling of 50 ml detrusor wall thickness starts to drop, which is why in Urogynaecology measurements are usually undertaken after bladder emptying. DWT measurement by translabial ultrasound seems to be highly reproducible, with an intraclass correlation of 0.82 (CI 0.63- 0.91) found in a series of 67 patients. DWT is significantly higher in women with symptoms of urge incontinence and urodyna-mically proven detrusor overactivity (Khullar et al., 1996), but the strength of the association seems insufficient to be of much use in clinical practice (Lekskulchai et al., 2006). Increased bladder wall thickness is likely due to hypertrophy of the detrusor muscle, which is most evident at the dome; this may be the cause of symptoms or simply the effect of an underlying abnormality. Marked thickening of the detrusor (Figure 2) is suspicious of neuropathic bladder dysfunction. In young neurologically intact women, detrusor wall thickness is almost universally below the threshold of 5 mm at the dome (Lekskulchai et al., 2005). Detrusor wall thickness may be a predictor of de novo detrusor overactivity after Burch colpo-suspension (Robinson et al., 2005). It is quite likely but remains to be proven that determination of this parameter can contribute to the work-up of a patient with pelvic floor and bladder dysfunction, e.g. as a predictor of postoperative voiding function or de novo/ worsened symptoms of the irritable bladder. Postoperative haematomata may be visible after vaginal surgery or suburethral slings and at times explain clinical symptoms such as voiding dysfunction or persistent pain (see Figure 4). 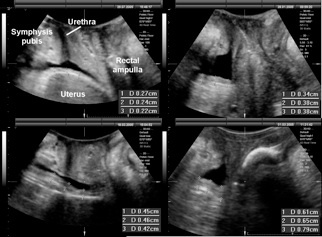 Urethral diverticulae (see Figures 5-7) are unlikely to be missed, especially if the examination is performed after voiding, and if care is taken to inspect the paraurethral areas. Most are located dorsal to the urethra as in Figure 5, but occasionally one may be found ventral or anterior to the urethra, ie., developing into the Space of Retzius, as in Figure 6. The main differential diagnosis is Gartner cysts, i.e., a cystic remnant of the Wolffian duct located in the vaginal wall (see Figure 8), but it is often possible to differentiate the two due to their location relative to the urethra. In addition, urethral diverticulae are more likely to be symptomatic and tender on examination, and often appear rather complex in appearance, showing a convoluted or multicystic structure, commonly with internal echogenicity. Sometimes they are accom-panied by hyperechogenic areas as in Figure 7. Both urethral diverticulae and Gartner cysts may occasionally be confused with a nabothian follicle (see Figure 1 in Prolapse), but correct identification of the cervix will make such a mistake highly unlikely. A Valsalva manoeuvre will lead to differential movement of the tissues and help in correctly attributing cystic structures to the vaginal wall, cervix, bladder or urethra. Finally, labial cysts may be detected close to the transducer surface in parasagittal planes. 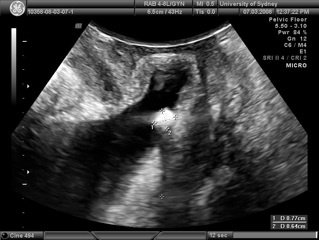 A range of other abnormalities, incidental or expected, may at times be imaged on translabial ultrasound, although a full pelvic ultrasound assessment does of course require a transvaginal approach. A vaginal fibroma may cause circumscribed isoechoic findings within the vaginal wall. 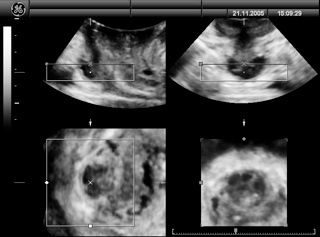 Occasionally, a concrement (Figure 9) or a bladder tumour may be found (Figure 10), and intravesical stents and bladder diverticulae can also be visualized. Figure 9: Bladder stone in patient with sypmtoms of prolapse and recurrent urinary tract infections. Figure 1: Detrusor wall thickness measure-ments in the midsagittal plane. From: Dietz et al., Pelvic Floor Ultrasound. Springer London, 2007. Figure 3: Determination of residual urine (for formula see text). From: Dietz et al., Pelvic Floor Ultrasound. Springer London, 2007. Figure 5: Posterior urethral diverticulum (arrow), neck visible close to bladder neck. Figure 6: Anterior urethral diverticulum. Multi-planar and rendered views give a good appre-ciation of spatial relationships. Figure 7: Minimal urethral diverticulum (< 5 mm), surrounded by hyperechogenic foci. 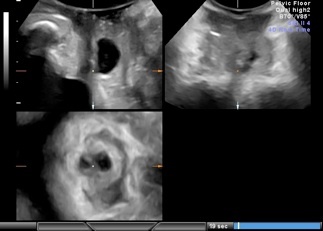 This diverticulum was asymptomatic and is treated expectantly. 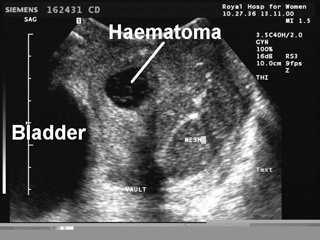 Figure 8: Gartner cysts in close proximity to the bladder neck. Note that the urethral rhabdosphincter is intact in all planes, and that the cyst reaches the levator ani.